With grilling season in full swing, now’s the time to try some different side dishes to bolster the taste of your summer fare. This light, flavorful salad quickly is moving up the list as one of Turf Medic’s fresh favorites. Healthy and extremely easy to prepare, this recipe is sure to get everyone eating their greens. 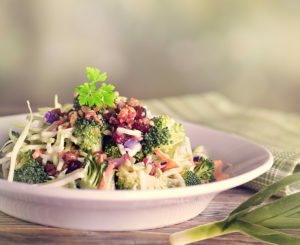 Put broccoli, bacon, onion, seeds, and cranberries into a large salad bowl. In another small bowl, stir up mayo, vinegar, and sugar – this will serve as our dressing. Feel free to add salt and pepper to your preferred taste.